Grandfather and Boy on Rocking Horse, this Norman Rockwell painting, appeared on the cover of The Saturday Evening Post published December 16, 1933. The alternate title for this painting is just Rocking Horse. This painting was Rockwell's 148th overall of 322 total pictures featured on the cover of The Post. Rockwell's career with the Post spanned 47 years, from his first cover illustration, Boy With Baby Carriage in 1916 to his last, Portrait of John F. Kennedy, in 1963. This was also the sixth Rockwell cover in 1933. The Post featured a Rockwell illustration on its cover six times in 1933.
on page 126 of Norman Rockwell, A Definitive Catalogue by Laurie Norton Moffatt. This is one of my very favorite Christmas paintings. It absolutely conveys a spirit of having fun and being carefree. This is a fairly simple painting. There are only three characters in the whole painting, the grandfather, the boy and the rocking horse. The grandfather looks like he is having the most fun. Clearly, he is too big to be riding on the rocking horse. His feet are too big for the stirrups. His behind is too big for the saddle. And yet, here he is, riding anyway. He is riding so hard that he is losing his eye glasses. He is riding so hard that his under sized cowboy hat has slid off his head. Ane he is smiling a child's smile, as an adult can only when he is acting like a child. Bravo! The second character is the boy. The boy looks like he holding on for dear life. He has his lips pursed as if he is about to squeal. The rocking horse is obviously a present for the boy. He is dressed in standard cowboy outfit. Chaps, vest, bandana, western style plaid shirt... the only thing missing is the cowboy hat. Grandpa has commandeered the hat. The boy is barely hanging on, sitting precariously on the back end of the rocking horse. 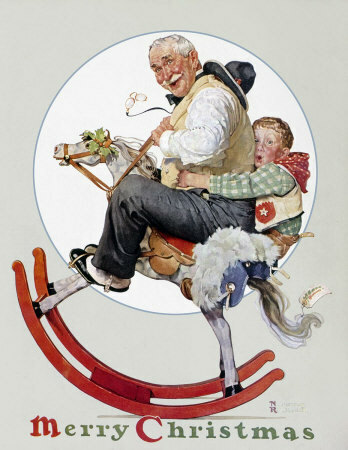 Grandfather and Boy on Rocking Horse was only one of 322 Norman Rockwell Saturday Evening Post covers; Here is the list of Norman Rockwell Saturday Evening Post cover illustrations. The rocking horse is a Christmas present. We can tell from the holly around his bridle and the gift tag hanging from his tail. We can actually read the word "Christmas' on the tag. The horse is barly able to withstand this load. He was not built for an adult to ride on. You can almost hear the horse groan!